How did everyone enjoy Opening Day? Even though the Yankees lost to the Red Sox 9-7 on Sunday, I am thrilled baseball is back. It just naturally puts me in a better mood. I was in Washington D.C. yesterday for the opener between the Phillies and the Nationals, and you would have thought it was a Philadelphia home game. That crowd was pro-Phillies (here's my shameless plug for for my article). I had a nice time and spent some time in the stands with fans. Then, I got home four hours later in time to catch the final few innings of the A's game. With MLB Extra Innings free for the first week, it was cool to see some west coast baseball without paying for it -- but then I actually watched the game and wanted to cover my head. 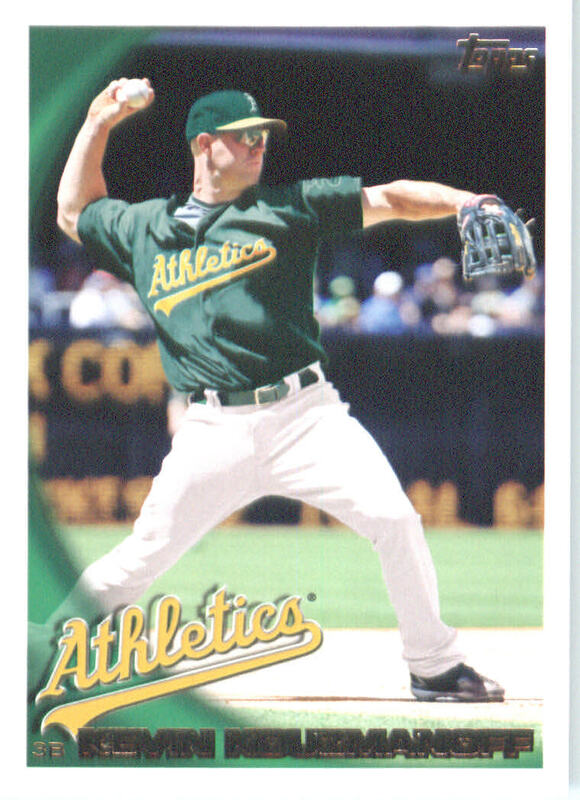 Kevin Kouzmanoff did not have a good first game with the A's. He went 0-for-4 with two GIDP (those were the only two at-bats I saw) and committed an error that prolonged the inning. The winning run scored on the next at-bat. He made all of three errors last year (and did not win a Gold Glove). Green is not flattering for my boy. Hopefully, he can turn it around and get moving. But the advantage to this is maybe I will stop fighting with new Kouz fans on eBay. I can't believe how much some of the cards have been going for. Last year, he slumped early as well. But then the Padres came to the Philadephia, him and I had a nice chat. Then, amazingly, he hit a home run off Brad Lidge to break his consecutive save streak. Coincidence? I'm thrilled baseball is back. There have already been some amazing moments (Buehrle's unbelievable play, Hayward's home in his first ab, Pujols hitting two bombs etc). The Mariners/Oakland game was great. Watching the Mariners run like maniacs was cool. Buehrle's play was absolutely crazy. Kouz hit a homer on the first pitch he ever saw in the big leagues. Actually, a grand slam. Pujols and Lind with first AB homeruns to start the season! So awesome, I may have been more excited watching their first ABs than watching the Yankees. Tonight is Cano's turn for a homerun. You think you've got it bad with the Kouz thing; I am STUCK watching the A's (and Giants) damn near every night. While I admittedly don't hate either team, I openly state that watching A's baseball is pretty friggin boring. Gah. At least the green is better than the "sand" uniform the Padres sometimes wear on the road. More often than not they go with the blue alternates, probably because of how hideously ugly the 'sand' jersey is. I started watching MLB.tv for the first time. I got the expensive yearly plan because I'm in a baseball dead zone and don't really have cable. Quality is spotty. Jays game was meh, but the Twins/Angels game was full HD throughout without any issues. So far tonight the TB/O's game is decent, with a little spottiness now and then. Loved opening day, not good that the Astros lost. Well, I'm not a huge fan of the fact that the Twins lost, but I do love their new road unis.